Scott Cawthon's animatronic horror story is coming back to haunt us once more. Five Nights at Freddy's news keeps coming right on out of the woodwork. Does creator Scott Cawthon ever sleep? As of yesterday, his official website has posted the third teaser for Five Nights at Freddy's 4, the latest installment in the ridiculously popular jump scare adventure that has everyone thinking twice about hanging out where any animatronic bears dwell -- or mice, and that includes you, Chuck E. Cheese. Five Nights at Freddy's 4 is very much a real thing that's headed for release, and supposedly will greet its adoring public on Halloween Day. That's pretty appropriate, especially given how absolutely terrified most people seem to be of this simple little game. 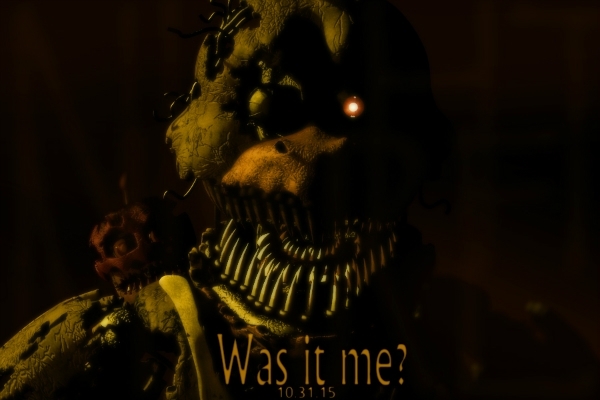 The teaser image on Scott's official site features a character known as "Nightmare Chica," as dubbed by faithful fans. The image features the phrase "Was it me?" in reference to some of the creepy, twisting and turning story events from the game that already has fans guessing what they might be in for when the game finally makes it out to them. This also seems to be the very last chapter in the series, though honestly if Cawthon played his cards right it probably could have gone on forever, but I suppose it is about time to put all fan theories and questions to rest. We've got a little ways to wait still, but what are your Five Nights at Freddy's 4 theories? What do you think about Nightmare Chica? What's going to go on with the "Bite of '87" event? Only time will tell...and the animatronics, of course.